Alhamra (mall) hall 2, Lahore , Pakistan. 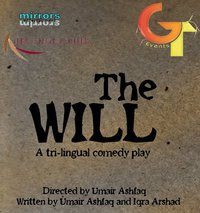 From the makers of " Ishq with a twist"," Kashti (the play)", "the Addams family rendezvous" and "Gramathon 2010 (shor macha)"
A trilingual comedy play, written by Umair Ashfaq and Iqra Arshad. The play revolves around the will of a late colonel. It revolves around a bunch of people from different backgrounds who helped the colonel during his life and are now entitled to his property..."BUT ON ONE CONDITION!!!!!!" ------> they need to spend one night in the colonels mansion which is haunted by a ghost! Who’s the ghost? What does he want? Why is he here? All that is part of the suspense.The chaos and panic in all of those people add an element of humor and fun in the plot of the play. We guarantee that we would not let anyone leave the hall without a smile on their face! Please Join A&N Productions and Mirrors Entertainment Facebook group to stay in touch with our future productions!